I’m a Sport and Exercise Scientist and a Senior Lecturer in Sport and Exercise Physiology at the University of Portsmouth, UK. I gained both my PhD (2007) and MSc (with distinction, 2001) from Brunel University, UK, and my BSc (Hon) from Luton University (1998). I’m an accredited Sport and Exercise Scientist with the British Association of Sport and Exercise Sciences (BASES), and an advisor to both the Amateur Swimming Association of England and the English pistol Shooting squad. Most of my childhood was either spent in or around water and when I stopped competing I began coaching. The unique environment of swimming and its effects on the body have always interested me. For example, swimmers must breathe in (and hence expand the chest) against the hydrostatic pressure of water, which is greater than that of air. This increase in pressure has a number of negative effects on the body and coupled with a horizontal position it increases the work of breathing. On top of this breathing must be coordinated with stroke cycle and therefore cannot occur truly ad libitum. When I first started investigating the breathing muscle demands of swimming I was amazed that the occurrence and consequences of breathing muscle fatigue in swimming had been overlooked. The rest as they say is history. 2. You recently published a couple of articles related to swimming, could you briefly explain the practical results? Most of my work focuses on the occurrence and consequences of inspiratory muscle fatigue (otherwise known as IMF) in swimming. We have found that IMF occurs in all swimming strokes and that being very fit does not prevent it. Also, swimmers do not need to be swimming flat out for IMF to develop. For example, swimming above critical velocity (or critical swimming speed) during 200m front crawl will cause it. Typically this equates to a swimming speed at, or in excess of, 90% of 200m race time. If the amount of IMF is large enough, blood flow to the working muscles is compromised causing a faster rate of fatigue. Our earlier work suggested that inspiratory muscle strength must fall in excess of 19% for this to happen. As the magnitude of IMF reported in trained swimmers can exceed 19%, an accelerated rate of limb muscle fatigue is a real possibility. We have also shown that swimming front crawl with IMF (we induced it before swimming) increases stroke rate and breathing frequency, and reduces stroke length during evenly paced swimming over a distance of 200m. As these changes are the opposite of those sought by coaches and swimmers, they have implications for training sets designed to improve stroke characteristics. 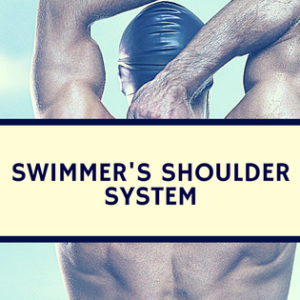 Interestingly, we have found similar changes during flat out arms only front crawl swimming too. The take home message is that IMF occurs during swimming, even in very well trained swimmers. It can negatively affect stroke characteristics, and has the potential to speed up the occurrence limb muscle fatigue. The good news is that we can do something about it. 3. Are there any ways coaches can measure IMF without high tech equipment? Without purchasing specialist kit, which can be expensive, it is not possible to verify the presence of IMF – swimmers will not necessarily be aware that they have it. Nevertheless, it is typically associated with an increase in the unpleasant sensation of breathing as well as an increase in breathing frequency and stroke rate. A word of warning here though, stroke rate and breathing frequency naturally increase with swimming speed independently of IMF. So an increase in stroke rate and breathing frequency should not automatically be taken as proof of IMF, even if swimmers are finding breathing unpleasant. IMF should be confirmed by a more direct measure and I would say that investing in a mouth pressure metre of some sort is worthwhile. 4. Any conclusions from the study to suggest whether an optimal breathing pattern exists for the 200 freestyle? The question of an optimal breathing pattern is an interesting one. One study suggested that breathing less frequently causes more IMF than breathing more frequently (one breath taken every fourth stroke instead of every second stroke). However, our research has been unable to support a relationship between breathing frequency and IMF. We have found that if IMF is induced before swimming, breathing frequency can increase as a result. But when we compared the magnitude of IMF between the four different strokes over a distance of 200m, we found no relationship between the magnitude of IMF and ad libitum breathing frequency occurring once every first, second or third stroke. It is important not to ignore the relationship between breathing frequency, stroke rate and stroke length here. All three can change in the presence of IMF and we have found relationships between IMF and stroke rate, and IMF and stroke length. If IMF is shortening stroke length and stroke rate is increasing to compensate, breathing frequency will also increase because breathing is coordinated with stroke cycle, especially during front crawl. The best we can say at present is that the magnitude of IMF is not affected by breathing frequency when swimmers take a breath no less frequently than once every third stroke during a competitive 200m swim. Clearly, more work is needed to understand the interactions between IMF, breathing frequency, stroke rate and stroke length. Focusing just on breathing frequency is likely to be too simplistic. IMF is not just restricted to front crawl. In a recent paper we reported that the magnitude of IMF is similar between backstroke, breaststroke, butterfly and front crawl (range of 18-22%) following 200m race-paced swimming. Similarly, IMF has been observed after swimming distances of 100m, 300m and 400m front crawl. This indicates that it is not the distance per se that determines whether or not the inspiratory muscles fatigue, but the demands being placed upon them. This is what we would expect to see. 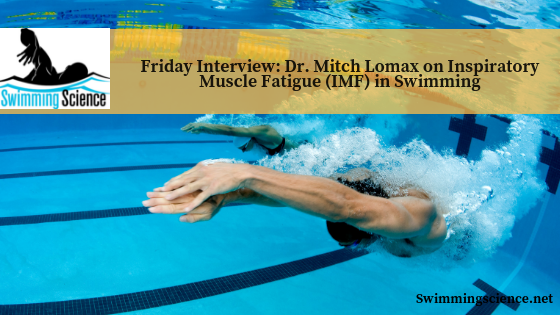 Typically research has examined the occurrence and impact of IMF in response to a single swim rather than a training set, or when competing in multiple events over the course of a day or two. How long IMF persists will depend on the type of fatigue experienced. It can take hours, maybe even days, to recover from low frequency fatigue, but only minutes to recover from high frequency fatigue (both of which are types of peripheral fatigue). If the demands being placed on the inspiratory muscles continue to reduce their functional capacity, it would be illogical if IMF didn’t accumulate. Indeed, we know that the magnitude of IMF is linked to swimming speed and hence exercise intensity. However, a fatigue limit would at some point be reached. It is also possible that the inspiratory muscles might start to recover during a subsequent swim. How this scenario would affect overall swimming performance we don’t yet know. It is conceivable that swimming speed would need to be reduced in this situation. Alternatively the magnitude of fatigue, in for example the arm muscles, might be greater yet speed maintained. At present we simply don’t know enough about IMF in swimming. 7. What do you think is the best way to strengthen the inspiratory muscles? It is clear that swim training alone is not sufficient to protect against IMF. Targeted training of these muscles is my advice i.e. inspiratory muscle training (IMT). There are various devices that can be purchased to train the breathing muscles, some are relatively inexpensive and others more so. These devices target either the inspiratory muscles or permit both the inspiratory and expiratory muscles to be trained (expiratory muscle fatigue is less frequently reported in the scientific literature but there is evidence that it too can negatively impact exercise). There are also different types of respiratory muscle training e.g. pressure threshold training, flow resistive training and voluntary isocapnic hyperpnoea. Regardless of the type used, IMT is easy to incorporate into a training programme and can be undertaken by swimmers at home or could be integrated into a training session by a coach – typically the kit used is light and most devices are hand held. The type of IMT we administer (pressure threshold training) takes about 5 minutes to complete twice a day and consists of 30 breaths with a force equivalent to ~50% of maximum. We have seen that inspiratory muscle strength improves in as little as four to six weeks with such a programme, and so too does performance. However, the benefits appear to plateau after around six weeks and begin fade entirely after a few months if IMT is stopped. We are currently investigating how to incorporate IMT into a swimming training programme for long term benefits i.e. IMT periodization. It is also relevant to note that a targeted inspiratory muscle warm-up can improve swim time. This can be done using the same IMT device immediately before a competitive event. Typically such a warm-up consists of 2, 30-breath sets at a load equivalent to ~40% of maximum. Importantly, whether undertaking IMT or an inspiratory muscle warm up, hyperventilation must be avoided as this can result in fainting. We always medically screen individuals before administering this training programme or warm-up, and I would suggest that anyone thinking of undertaking either checks with an appropriately qualified medical practitioner before doing so. 8. What are your thoughts on purging and controlled exhalation? As purging expels carbon dioxide and therefore prolongs the time before the urge to breathe sets in, it can be dangerous. This is more likely to be an issue for free divers though who may be several meters under water when the urge to breathe becomes over whelming. Although purging can reduce breathing frequency and consequently the disruptive influence of breathing on stroke mechanics, swimmers do need to ensure that they are breathing frequently enough to meet the oxygen requirements of the working muscles. Performance of distances that rely heavily on the aerobic system to provide energy (I mean the re-synthesis of ATP here, which is the energy currency of cells) will be compromised if breathing frequency is too infrequent. So, there is a balance to be had. With regards to controlled versus explosive breathing, I personally prefer controlled exhalation or trickle breathing. I find it more natural, less disruptive and less demanding. 9. What research or projects are you currently working on or should we look from you in the future? We have a number of swimming projects going on at present as well as some non-swimming breathing muscle projects. In a study soon to be published (International Journal of Swimming Kinetics) we present our findings linking the development and magnitude of IMF to swimming speed. Other swimming projects include how to incorporate IMT into swimming training programmes for long term benefits, the activity patterns of those muscles which have a dual function in aiding breathing and propulsion, and the impact of different breathing frequencies on muscle activity. WHAT IS YOUR THOUGHT RE SAY 800 OR A 1500 MTR SWIM AND TRYING TO SPRINT THE NEXT DAY , IM AGAINST THIS BUT I SEE THIS BEING DONE . I BELIEVE REPEATS DAY AFTER DAY TO GET X NO OF METERS IN WILL SHORTEN THE STROKE AND THE DAY OF THE RACE THE SWIMMER WILL FIND IT HARD TO CHANGE THE RATE OF THEIR STROKE AND WILL THIS SHORTEN THE STROKE . What about the use of the FINIS Cardio Cap used with their freestyle snorkel? Restricts air flow – forcing the swimmer work harder to inhale…..any impact on IMF?